2009 brought me the opportunity to visit Bangkok, Thailand and Hanoi, Vietnam. I brought home a lot of memories and a lot of photos. 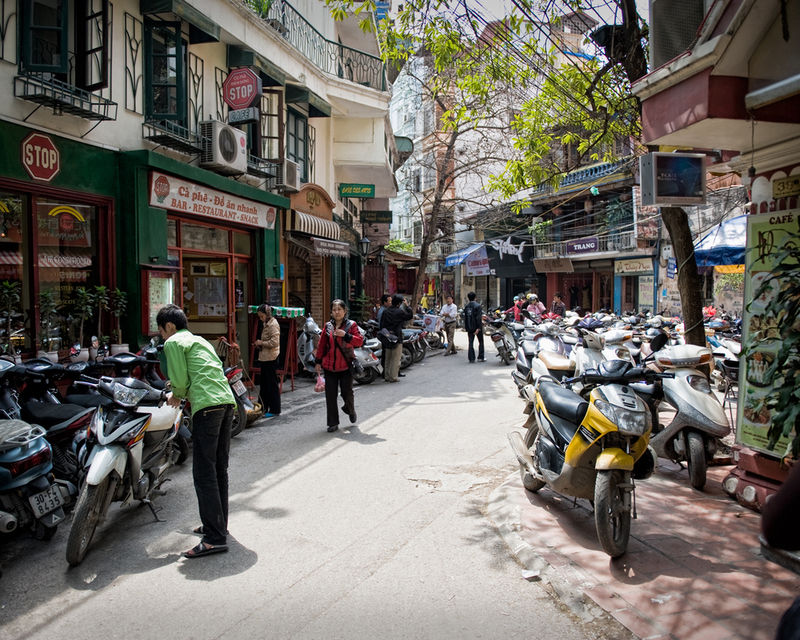 Hanoi was the second leg of the trip and made for a stark contrast from Bangkok. 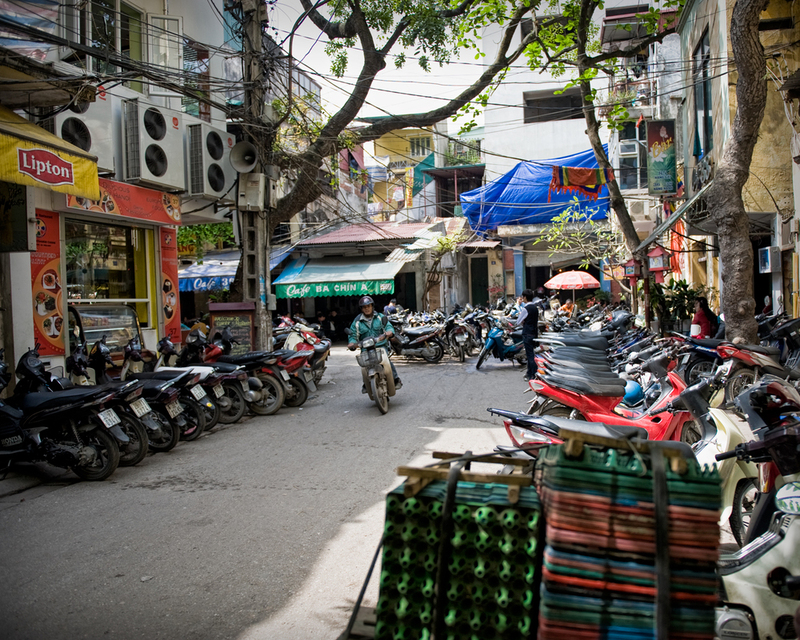 While the former was a huge and cosmopolitan city with a mostly polite and gentle culture, Hanoi was much more rough around the edges, with a definite "second world" vibe. It was my first time in a communist country and I got to experience some of the unique patterns that come with that. 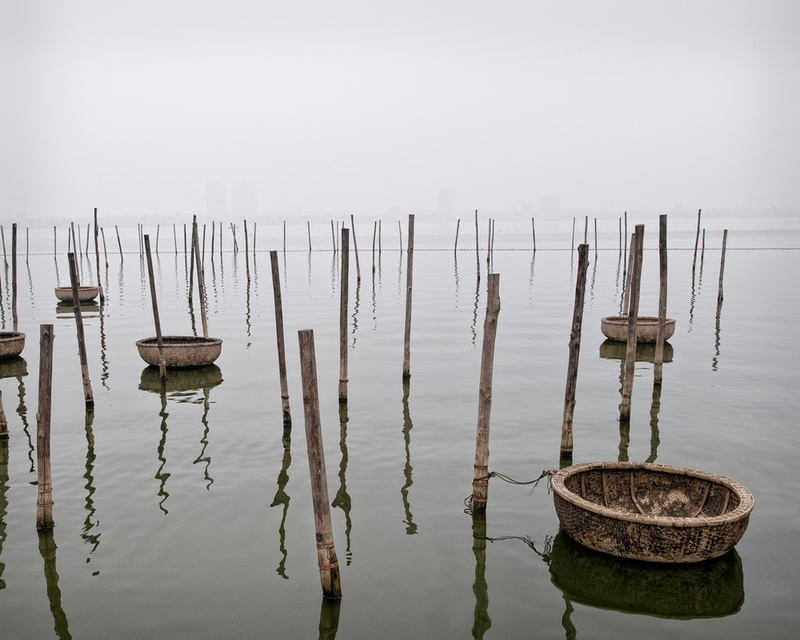 I was struck right off by the opulence of our hotel, situated on the bank of the West Lake area of the city. It was probably the nicest hotel I've ever stayed in, which was certainly a perk, but the sheer contrast it made with the city around it belied the classless ideal that communism is supposed to embody. Beyond the hotel compound, though, I must admit I noticed neither very rich people or people who appeared desperately poor. The overall condition and repair of virtually everything we saw was not up to first-world standards – bicycles and old scooters are far more common that cars, and you could find them loaded down with the most precarious loads. Pedestrians carried large loads in hand-made baskets and outside the city a very simple agrarian life seemed common. 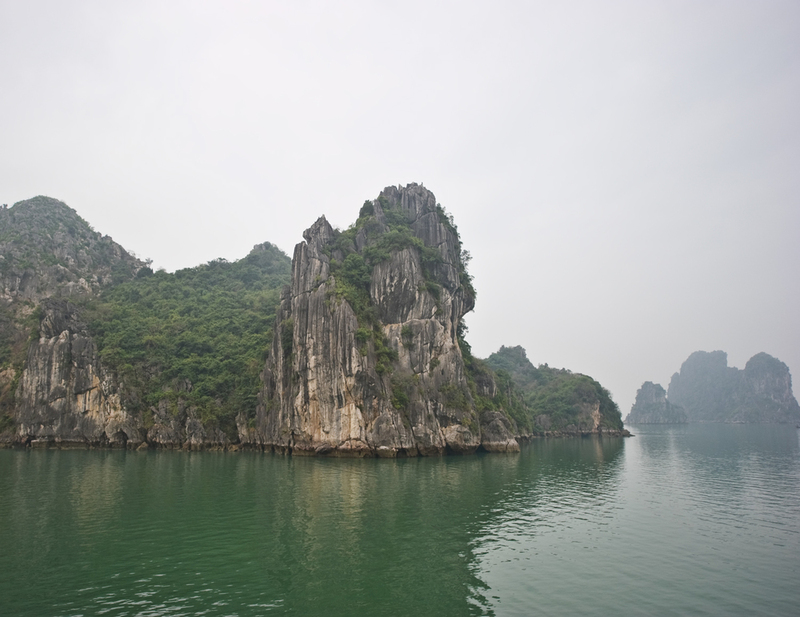 There is what appears to be private enterprise in Vietnam – we certainly dealt with an "enterprising" travel agency to book a side trip to nearby Ha Long Bay. We booked an overnight cruise on the scenic bay months in advance, transferring a deposit using some international version of a Paypal-like system. Things got interesting when we called to confirm things from the hotel, whereupon the person we spoke to gave us a much earlier morning pickup time than was indicated in the itinerary. In the end we agreed on a compromise time after what could only be called an awkward negotiation. We were given a cellphone number for our driver, who would from then on be our sole contact with the agency. Our driver turns out to be a somewhat gruff young guy in an aging passenger van. He collects the balance of our payment and transfers us to another bus. He gives us an explanation of how things will unfold from there. His broken English does not put us at ease with the multiple transfers that will take place, but we go with the flow and eventually arrive at the tour ship office. Things get better from that point, as the tour ship is operated by a French company and everything there runs like clockwork. The ship is nice, as is the crew, the food, our stateroom, the bar and just about everything else. The cruise is a great experience and all is well until we return the following day. Back at the cruise terminal, our worries that the travel agent's vague instructions would not serve us well started becoming real. We didn't see the expected bus but noticed the other passengers seemed to have found their various buses and taxis. The cruise agent was quite helpful and called the travel agent, who informed her that our bus was gone and we'd have to wait several hours for transportation back. With the helpful cruise agent as our translator, we quickly determined the travel agent was no longer concerned with our itinerary or our displeasure – after all, he'd collected all of his money at this point. Since we need to get back to Hanoi on schedule, we have the cruise agent help us find a taxi back to our hotel. The bad part, of course, is that we weren't getting the transportation we'd paid for and the ride was a full three hours. The only silver lining was that a marathon cab ride like that, while not cheap, was affordable enough to be a no-brainer. The cab ride was an experience I'll never forget. Our driver spoke practically no English and did not know his way around Hanoi. About halfway we stop for a bathroom break at a decidedly non-touristy way station. With the language barrier we found it hard to gauge our driver's intentions and felt glad when it turned out we weren't to be robbed and left here. The restrooms here consisted of an open sewer pit and the smell was hard to endure. Attendants used garden hoses to get things to "flow" best they could. Crazy. Once we reached Hanoi, our driver needed to stop to ask directions. Again the language barrier and our newfound paranoia reared their head, as we worried that he was going to drop us off in some far corner of the city. After a few detours and more stops for directions it all ended well with us safe and sound back at the hotel, in time to keep us on our schedule. Boats at the tourist island dock, Ha Long Bay. When it was all said and done, we just caught a bit of bad luck with a shady travel agent. Everyone else involved in our little adventure was earnest and helpful, though the language barrier served to sustain some uncertainties through the long cab ride. We certainly weren't the sort who were looking for a sanitized, Americanized tour package. I've put in my time hiking solo around unfamiliar cities in unfamiliar countries and my girlfriend at the time had travelled professionally around the world as a university recruiter. It's not the first time either of us had been ripped off while travelling, either. What really stood out was the callous attitude of the "reputable" travel agent and the extent to which others seemed to indicate this was typical stuff. That fact alone makes it hard for me to recommend Vietnam as a vacation destination for most others. If you're up for this kind of adventure, it's certainly like no other place I've been. I hope things will improve, making Vietnam an appealing destination for more Westerners.